Check out our video on FACEBOOK to see how these issues have been solved. Food and Drink are generally packaged in some way which can then be easily stored on pallets. 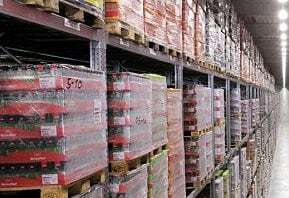 Depending on the layout of your warehouse, a range of aisle widths is possible to maximise your available space. Racking is not generally subject to any restrictions in layout and provides accessibility at all times to your goods.